With the growing interest from consumers looking for new, unique products, yellow– and orange-flesh watermelons might create opportunities for small-sized growers to differentiate their products. 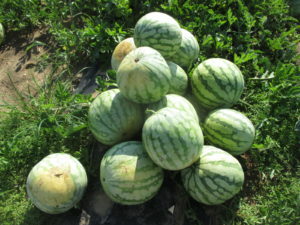 This article answers a few questions you may have about growing and marketing these unique type of watermelons. 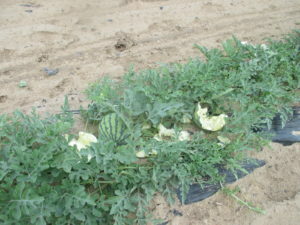 Yellow and orange-flesh watermelons usually have narrow strips with varying degree of green color as the background. The rind pattern is sometimes called tiger-striped rind pattern. There are also some cultivars that have similar outside appearance as the typical red-flesh watermelons. Like red-flesh watermelons, both seeded and seedless types of yellow- and orange-flesh watermelons are commercially available. Some examples of cultivars are listed in the table below. Table 1. Example yellow- and orange- flesh seedless and seeded watermelon cultivars and their seed sources. A few yellow- and orange-flesh watermelon cultivars were included in our 2018 watermelon variety trials conducted at the Southwest Purdue Ag Center in Vincennes, IN. Treasure chest (yellow flesh), Orange crisp (orange flesh), and Amarillo (yellow flesh) are seedless cultivars that were evaluated together with other 30 red-flesh commercial seedless watermelons. Baby doll (yellow flesh), Orangeglo (orange flesh) and Sorbet swirl (combination of yellow and orange flesh) were seeded watermelon cultivars that were evaluated together with other 6 red-flesh seeded watermelons. The trial was conducted in a fumigated field. Foliar diseases and insects were managed according to the Midwest Vegetable Production Guide for Commercial Growers. In the seedless watermelon trial, yields of the yellow- and orange- flesh varieties were higher than the average yield of 30 commercial red-flesh watermelons. Their yields were: Orange crisp (58,368 lb/acre), Treasure chest (53,884 lb/acre), Amarillo (53,561 lb/acre). It is encouraging to see that the three seedless yellow- or orange-flesh watermelon cultivars had an outstanding yield potential when they were grown under conditions without biotic and abiotic stresses. However, growers should be cautious that yellow- and orange-flesh watermelons tend to lack disease resistance, such as Fusarium wilt. In contrast, partial resistance to the pathogens have been incorporated into many popular red-flesh commercial watermelon cultivars. In our seedless watermelon trial conducted in 2010, Treasure chest was one of the most susceptible cultivars to Fusarium wilt. Regarding the seeded cultivars, the yield of Baby Doll (55,801 lb/acre) was comparable to other red-flesh cultivars, but the yield of Orangeglo (51,231 lb/acre) was lower. The yield of Sorbet swirl was the lowest in this trial (35,716 lb/acre), primarily because Sorbet swirl was an early variety with a very small canopy that leads to a significant yield loss caused by coyote damage in this trial. Figure 2. A small canopy of Sorbet swirl, and the damaged fruit caused by coyotes. Average fruit size of the cultivars were: Treasure chest (16.8 lb), Amarillo (14.7 lb), Orange crisp (15.4 lb), Baby doll (15.7 lb), Orangeglo (20.1 lb), Sorbet swirl (12.77 lb). Treasure chest produced much larger fruit than what was reported by seed companies (6-9 lb) in the short row trial. Orangeglo has oblonged fruit with average 15’-length and 9’-width. Other cultivars produce oval to round fruit. Sugar content of most of the yellow- and orange-flesh varieties were in the similar range as the red-flesh watermelons. Orangeglo had a higher Brix value (11.6 °Brix) compared to other red-flesh seeded watermelons. The value of flesh firmness of the yellow- and orange-flesh melons were lower compared to most red-flesh cultivars. 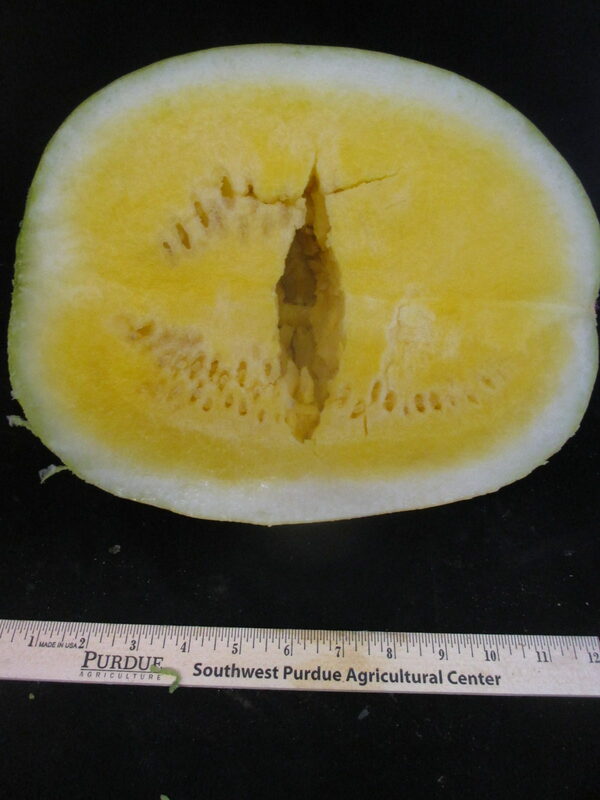 Hollow heart symptom was frequently observed and more severe for the yellow- and orange-flesh watermelons compared to most red-flesh watermelons. Orangeglo, Amarillo and Treasure chest are particularly susceptible to hollow heart in the trial. Figure 3. A yellow-flesh watermelon fruit with severe hollow heart symptom. We conducted an informal taste test at the 2018 Knox County Watermelon Festival, where we served the above-mentioned yellow- and orange-flesh watermelons as well as Fascination, one of the most popular red-flesh watermelons. Not surprisingly, more people rated the red-fleshed watermelon Fascination as their favorite watermelon. The second highest rated watermelon was Treasure Chest and then followed by Amarillo. People told us that before tasting the yellow-flesh watermelon, they thought it appeared to be pineapple, while orange-flesh fruit reminded them cantaloupe. Several people commented that they were willing to purchase the yellow- or orange-flesh watermelons with good taste. Other people thought they probably won’t purchase yellow or orange-fleshed watermelon if they had not tasted it before.